WHAT IS THE MEANING OF OUR EXISTENCE? Periodically, life pulls the proverbial rug from under our very feet and we are left bereft of hope, direction and meaning—career paths in which time and energy are expended lead to a dead end; health issues beleaguer the body rendering us captive to its failing capabilities; people we thought soulful and sensitive and with whom we believed to have a meaningful connection dupe and deceive and discard us with cruel and coldhearted contempt. When everything falls apart, what is left? Even our cries to the Creator seemingly fall on deaf ears. So often, it is the realm of literature that facilitates making sense of the world and who better to seek solace with in moments of despair than Leo Tolstoy, someone who himself had a midlife existential crisis, despite being at the zenith of his artistic career in terms of fame, respect and financial remuneration, as well as having a happy family life. 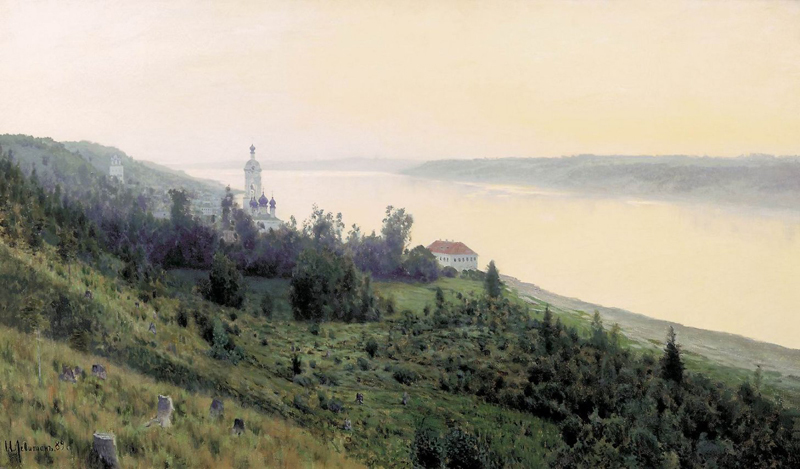 For the Russian literary maestro, life had become utterly meaningless, devoid of significance and purpose, and yet through his meticulous process of self-examination, he was able to come out on the other side by finding redemption in the very act of being alive. 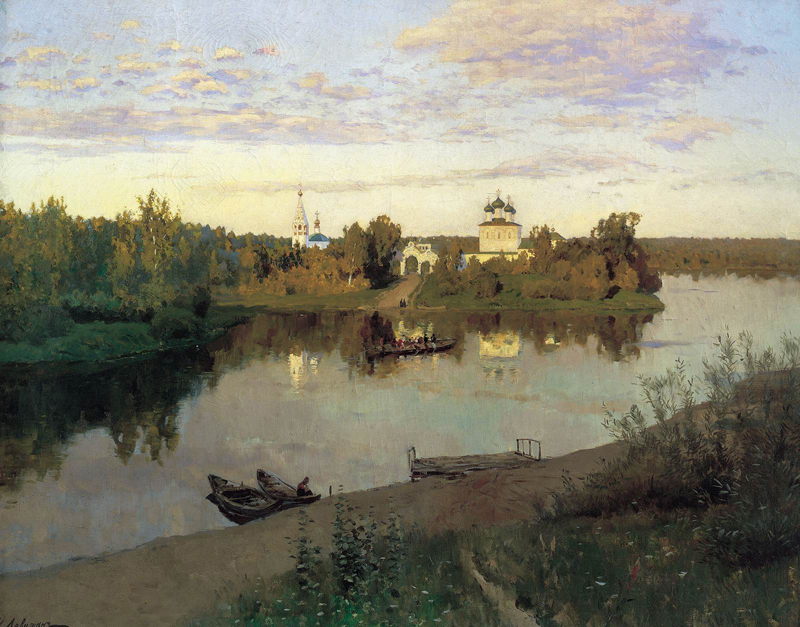 Isaac Levitan, Evening. Golden Plyos. My life came to a stop. I could breathe, eat, drink, and sleep; indeed, I could not help but breathe, eat, drink, and sleep. But there was no life in me because I had no desires whose satisfaction I would have found reasonable. If I wanted something, I knew beforehand that it did not matter whether or not I got it. If a fairy had come and offered to fulfil my every wish, I would not have known what to wish for. If in moments of intoxica­tion I should have not desires but the habits of old desires, in moments of sobriety I knew that it was all a delusion, that I really desired nothing. I did not even want to discover truth anymore because I had guessed what it was. The truth was that life is meaningless. It was as though I had lived a little, wandered a little, until I came to the precipice, and I clearly saw that there was nothing ahead except ruin. And there was no stopping, no turning back, no closing my eyes so I would not see that there was nothing ahead except the deception of life and of happiness and the reality of suffering and death, of complete annihilation. I grew sick of life; some irresistible force was leading me to somehow get rid of it. It was not that I wanted to kill myself. The force that was leading me away from life was more powerful, more absolute, more all-encompassing than any desire. With all my strength I struggled to get away from life. The thought of suicide came to me as naturally then as the thought of improving life had come to me before. This thought was such a temptation that I had to use cunning against myself in order not to go through with it too hastily. I did not want to be in a hurry only because I wanted to use all my strength to untangle my thoughts. If I could not get them untangled, I told myself, I could always go ahead with it. And there I was, a fortunate man, carrying a rope from my room, where I was alone every night as I undressed, so that I would not hang myself from the beam between the closets. And I quit going hunting with a gun, so that I would not be too easily tempted to rid myself of life. I myself did not know what I wanted. I was afraid of life, I struggled to get rid of it, and yet I hoped for something from it. Indeed, Albert Camus said that the only truly serious philosophical question one must ask oneself is whether or not to commit suicide and this is the very enquiry upon which Leo Tolstoy embarks when faced with life’s ultimate conundrum: “If God does not exist, since death is inevitable, what is the meaning of life?” Despite reading ferociously through all branches of human knowledge—philosophy, theology, mathematics—the lack of any absolute answer to this perennial question meant that life for him had become nonsensical and futile. 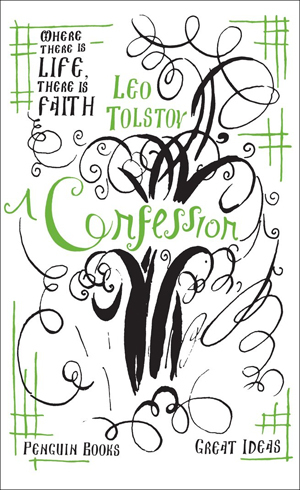 And thus in his seminal essay written at the beginning of his fifties, A Confession (originally titled An Introduction to a Criticism of Dogmatic Theology), Tolstoy elucidates both elegantly and eruditely the inner workings of his conscience to formulate a deeply personal account of the turmoil within the very depths of his soul, not least his vocation as a writer and artist. Art, literature … Under the influence of success and praise from others I had persuaded myself for a long time that this was something that may be done in spite of the approaching death that will annihilate everything—myself, my works, and the mem­ory of them. But I soon saw that this, too, was a delusion. It became clear to me that art is an ornamentation of life, something that lures us into life. But life had lost its charm for me, so how was I to charm others? As long as I was not living my own life but the life of another that was carrying me along on its crest, as long as I believed that life had a meaning, even though I could not express it, the reflection of every kind of life through literature and the arts gave me pleasure; I enjoyed looking at life in the mirror of art. But it did not stop here. Had I simply understood that life has no meaning, I might have been able to calmly accept it; I might have recognized that such was my lot. But I could not rest content at this. Had I been like a man who lives in a forest from which he knows there is no way out, I might have been able to go on living; but I was like a man lost in the forest who was terrifed by the fact that he was lost, like a man who was rushing about, longing to find his way and knowing that every step was leading him into deeper confusion, and yet who could not help rushing about. This was the horror. And in order to be delivered from this horror, I wanted to kill myself. I felt a horror of what awaited me; I knew that this horror was more terrible than my present situa­tion, but I could not keep it away and I did not have the patience to wait for the end. No matter how convincing the argument was that a blood vessel in the heart would burst anyway or that some­ thing else would rupture and it would be all over, I could not patiently await the end. The horror of the darkness was too great, and I wanted to be free of it as quickly as possible by means of a rope or a bullet. It was this feeling, more powerful than any other, that was leading me toward suicide. Tolstoy goes on to expound four possible positions to adopt to the dilemma of our tortured being: ignorance; Epicureanism (hedonism); suicide; accepting one’s lot. Each of the first three attitudes he deconstructs with practical brilliance, opting for the final state of simply living one’s life, despite its inherent absurdity and ridiculousness. And yet Tolstoy cannot fully resign himself to a meaningless existence, forever condemned to an atheistic void. 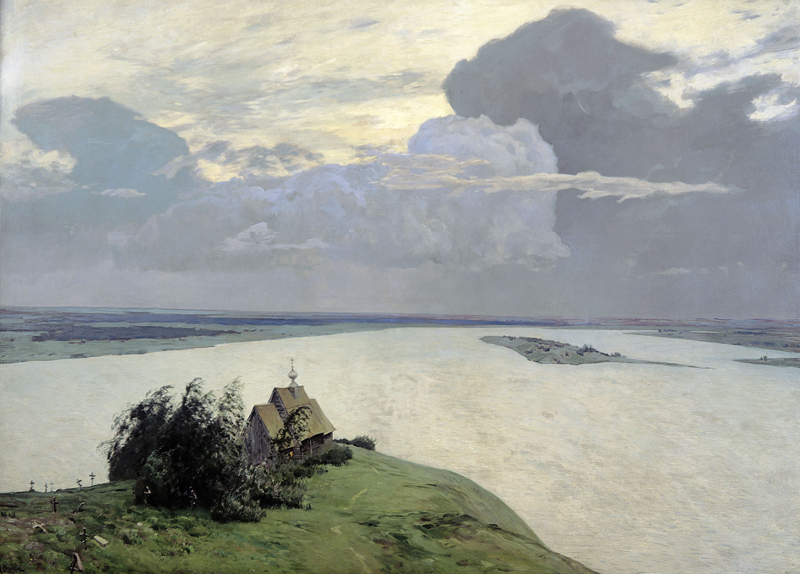 Failing to find any definitive answer within classic philosophical arguments, he thus turns toward a more mystical, intuitive affirmation of the presence of God, which he discovers in the presence of nature. 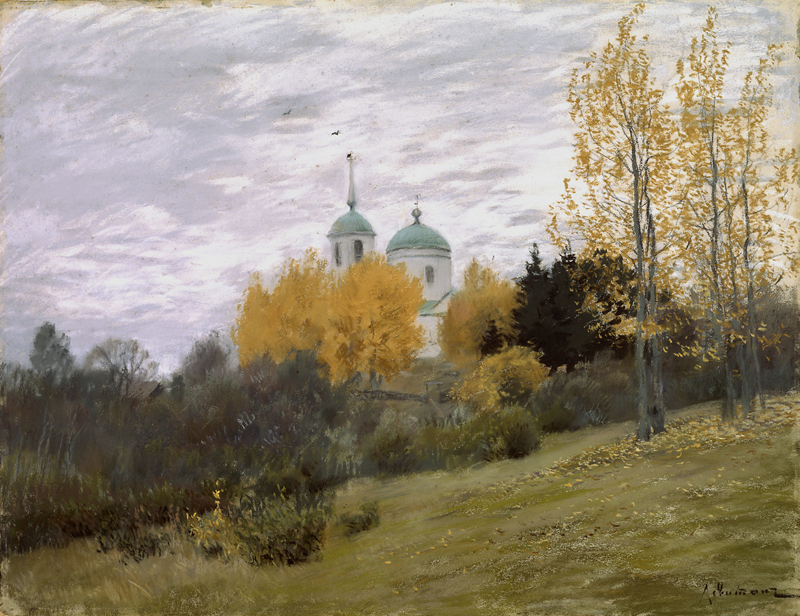 Isaac Levitan, Above the Eternal Peace. I remember one day in early spring when I was alone in the forest listening to the sounds of the woods. I listened and thought about the one thing that had constantly occupied me for the last three years. Again I was searching for God. ‘But where does my notion of God, of the one whom I seek, come from?’ I asked myself. And again with this thought there arose in me joyous waves of life. Everything around me came to life, full of meaning. But my joy did not last long. My mind continued its work. ‘The concept of God,’ I told myself, ‘is not God. A concept is something that occurs within me; the concept of God is something I can conjure up inside myself at will. This is not what I seek. I am seeking that without which there could be no life.’ Once again everything within me and around me began to die; again I felt the longing to kill myself. But at that point I took a closer look at myself and at what had been happening within me; and I remembered the hundreds of times I had gone through these deaths and revivals. I remem­bered that I had lived only when I believed in God. Then, as now, I said to myself, ‘As long as I know God, I live; when I forget, when I do not believe in him, I die.’ What are these deaths and revivals? It is clear that I do not live whenever I lose my faith in the existence of God, and I would have killed myself long ago if I did not have some vague hope of finding God. I truly live only whenever I am conscious of him and seek him. ‘What, then, do I seek?’ a voice cried out within me. ‘He is there, the one without whom there could be no life.’ To know God and to live come to one and the same thing. God is life. 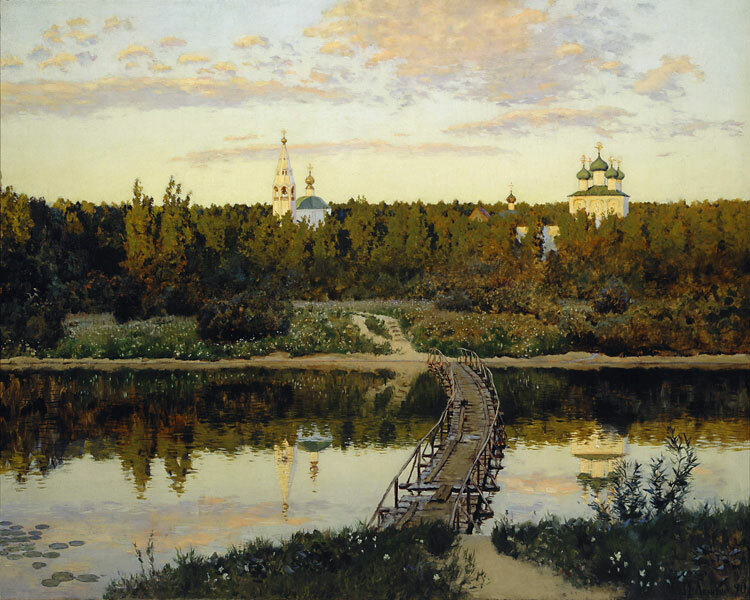 In a startling moment of self-illumination, Tolstoy appears to be describing a state more akin to Eastern mysticism whereby not only the universal cosmos but also his entire inner being has become one with the divine. By jettisoning all rational arguments of the existence of the Creator, he has finally found spiritual transcendence through simply accepting that life is a manifestation of the Lord. In an epilogue to the text, written three years later, Tolstoy describes a dream in which he perceives himself floating in the air, precariously supported by woven cords. The analogy is befitting in that it reaffirms his personal transformation and the enlightening insight he has gained. Indeed, it has been an excruciatingly painful journey, one which most people are unable to undertake; and yet, by relentlessly pursuing the act of self-enquiry right through to its conclusion, Tolstoy unequivocally demonstrates that, with courage and perseverance, even the most traumatic moments of one’s life can be overcome, peace may be found and God shall be regained. Here is the dream: I see that I am lying in bed. Feeling neither good nor bad, I am lying on my back. But I begin to wonder whether it is a good thing for me to be lying there; and it seems to me that there is something wrong with my legs; whether they are too short or uneven, I do not know, but there is something awkward about them. As I start to move my legs, I begin to wonder how and on what I am lying, something that up till now had not entered my mind. Looking about my bed, I see that I am lying on some cords woven together and attached to the sides of the bed. My heels are resting on one of the cords and my lower legs on another in an uncomfortable way. Somehow I know that these cords can be shifted. Moving one leg, I push away the furthest cord. It seems to me that it will be more comfortable that way. But I have pushed it too far away; I try to catch it, but this movement causes another cord to slip out from under my legs, leaving them hanging down. I rearrange my whole body, quite certain I will be settled now; but this movement causes still other cords to shift and slip out from under me, and I see that the whole situation is getting worse: the whole lower part of my body is sinking and hanging down, and my feet are not touching the ground. I am supported only along the upper part of my back, and for some reason I begin to feel not only uncomfortable but terrified. Only now do I ask myself what had not yet occurred to me: where am I and what am I lying on? I begin to look around, and the first place I look is down toward where my body is dangling, in the direction where I feel I must soon fall. I look below, and I cannot believe my eyes. I am resting on a height such as I could never have imagined, a height alto­gether unlike that of the highest tower or mountain. I cannot even tell whether I can see anything down below in the bottomless depths of the abyss over which I am hanging and into which I am drawn. My heart stops, and I am overcome with horror. It is horrible to look down there. I feel that if I look down, I will immediately slip from the last cord and perish. I do not look, yet not looking is worse, for now I am thinking about what will happen to me as soon as the last cord breaks. I feel that I am losing the last ounce of my strength from sheer terror and that my back is slowly sinking lower and lower. Another instant and I shall break away. And then a thought occurs to me: this cannot be real. It is just a dream. I will wake up. I try to wake up, but I cannot. ‘What am I to do, what am I to do?’ I ask myself, looking up.